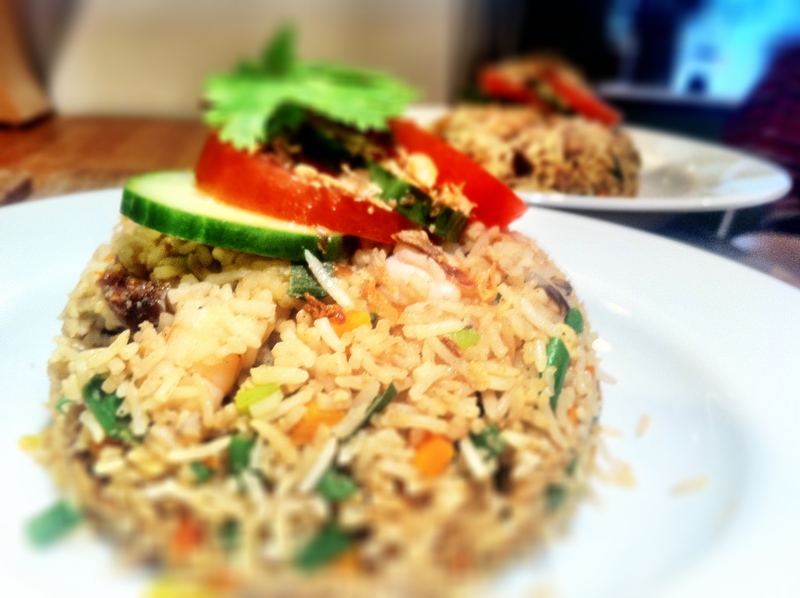 What I love most about fried rice is that it’s just as much fun to make as it is to eat. 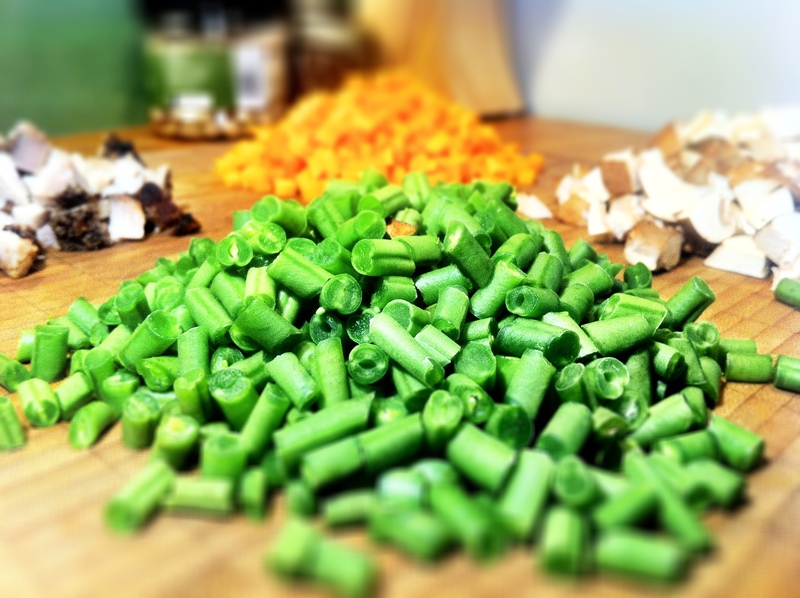 I love the preparation of it – choosing what I’ve got to put in it and then chopping my veg into little bits (frozen mixed vegetables are NOT a solution) – I find it deeply calming and soothing. Plus, when it gets to the frying bit, I love the noise, the constant clattering of spatula against wok, the roar of the fire and the constant sizzle and hiss of all the ingredients as they get tossed around in the wok. Even with all the chopping, it never takes longer than 15 minutes to prepare and 15 minutes to cook, making it one of my favourite midweek suppers. Leftover, cold white rice is really the only way to go, especially if you want your fried rice to be nice and fluffy rather than wet, dense and soggy. 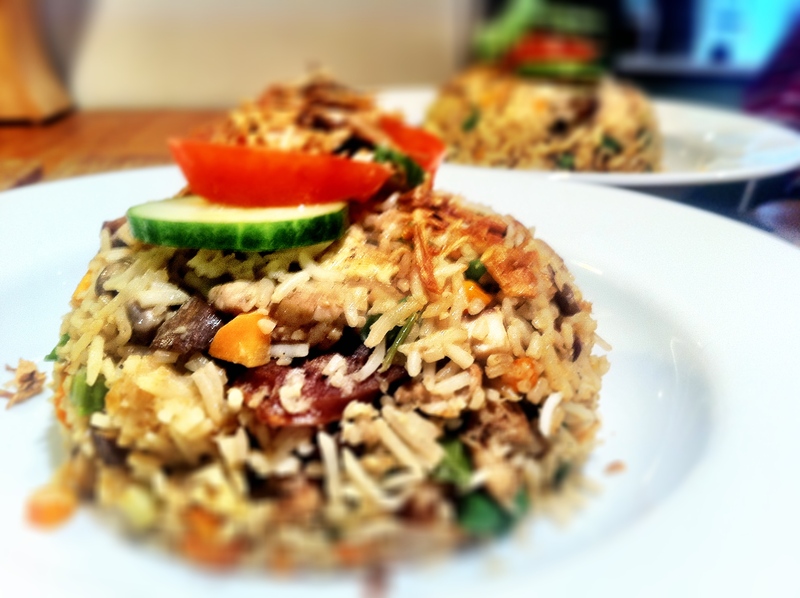 Fried rice is also a perfect foil for any leftover roast meats you have. Just chop it up into bits and chuck it in! The only thing I abhor, and it’s a totally personal thing, is that I can’t stand peas or frozen mixed vegetables in my fried rice. They just turn slightly soggy and I like my fried rice to have crunch and texture! But, if you love peas, or if you really can’t be bothered chopping your own veg, using frozen vegetables is quick and easy. Garnish with some fresh parsley/coriander and some sliced, fresh tomatoes and cucumber. Sprinkle with some fried red shallots. 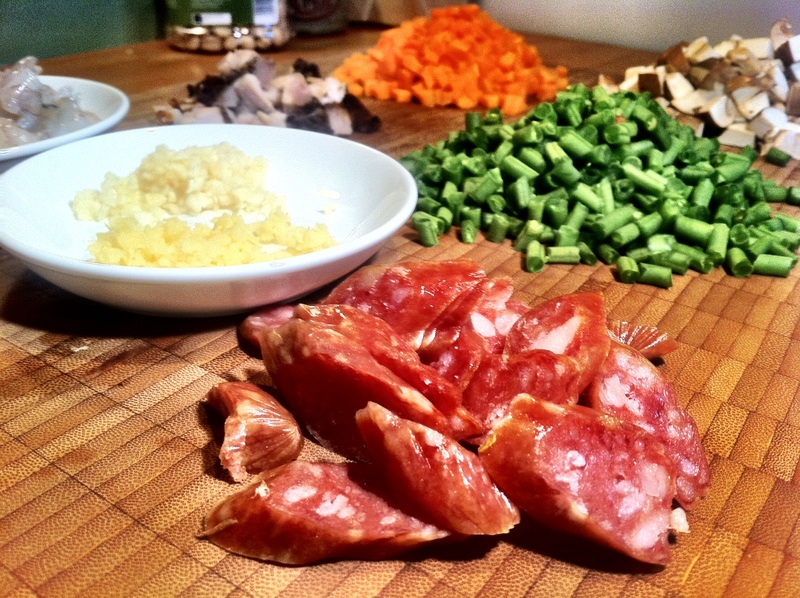 In a large wok, heat 1 tablespoon vegetable oil and when hot, add a teaspoon of salt, followed by the Chinese sausage. Fry the sausage until it releases its oil (only takes about one minute) and starts to brown. Add the marinated chicken, constantly tossing the chicken and sausage in the pan. The chicken will take no more than 1-2 minutes to cook. Then add the garlic and ginger to the wok. Add the carrots (fry for another 1-2 minutes), add the french beans and mushrooms and fry for another 1-2 minutes. Add 1 tablespoon of soy and 1 tablespoon of fish sauce, fry for another minute and pour the stir fry into a dish. Without cleaning the wok, add 2 tablespoons of oil and once hot, pour in the beaten egg. Immediately add in the cold rice. Keep stirring and tossing the rice to ensure it gets evenly coated with egg (about 1 minute). Add all the stir-fry to the rice and toss to mix all the ingredients in evenly with the rice. Add the prawns and continue to toss. You’ll know the prawns are cooked when they turn pink. Add your remaining soy, fish sauce and teriyaki and season with black pepper. If you want your vegetables softer, just keep frying them for another couple of minutes. If not, dish up and serve piping hot.